This recipe first appeared in the September 2011 newsletter. If you’d like a monthly update on health and food, add your email address to free newsletter sign up . I love Balinese food and this recipe is an old favourite. If you can’t find kangkung at an Asian grocer, English spinach works fine. You can make this dish with almost any blanched vegetables coated in this sauce, just add steamed rice, a bit of tofu or chicken and you’ve got a balanced meal. Prepare the shrimp paste in the usual way. I wrap it in a double layer of al foil and dry roast in a hot fry pan for a few minutes. Throw all the sambal ingredients in a food processor and blitz it. If you want an authentic version, work your arms by grinding in a large mortar and pestle. Add the kangkung or blanched vegetables. 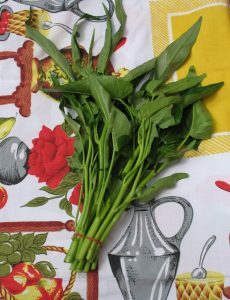 To prepare the kangkung, pour boiling water over the vegetable, then add the stalks to the sambal. Reserve the leaves for later in the cooking process. Toss vegetables in the sauce for a few minutes, over low to medium heat.. Add the lime leaves and spring onions then lastly the kangkung leaves. Give it a good mix through and take off the heat. This is a great side dish for any rice-based meal. I particularly like it in a Malaysian style (vegetarian) Nasi Lemak. This sounds amazing Jill. I’ll have to try this with kale or spinach! Awesome. Will be making regularly with Any veg I have in the house.